A list of all Berry types and what they do in Pokémon: Let's Go. 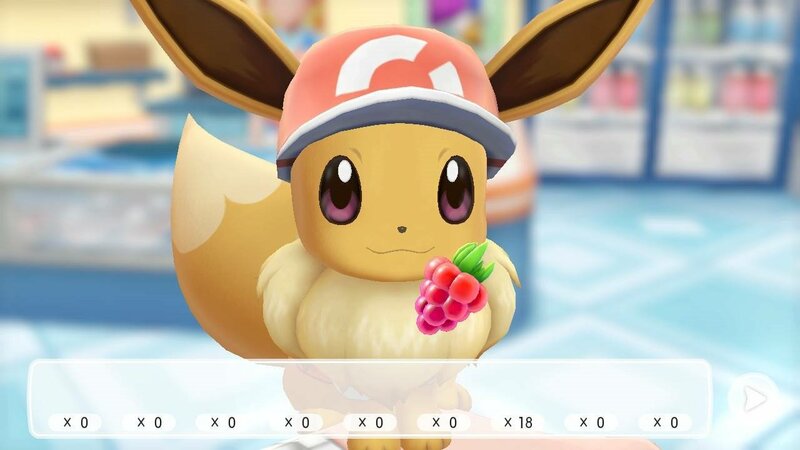 Similar to Pokémon GO, Pokémon: Let’s Go has a variety of Berry types that can be used on Pokémon. The first Berry you’ll encounter is the Razz Berry, though as you continue playing the game, other Berry types will become available. Wondering what Berries are usable in Pokémon: Let’s Go and what they do? We’ve got you covered! Below, we’ve put together a quick guide on all Berry types in Pokémon: Let’s Go. The Razz Berry can be used to increase your capture odds, or as a tasty snack for Eevee in Pokémon: Let's Go. In Pokémon: Let’s Go, there are a few different Berry types. Berries can be used to increase your chances of catching a Pokémon, or can be fed to your Pokémon (including Pikachu/Eevee). The first Berry type you’ll encounter in Pokémon: Let’s Go is the Razz Berry. The Razz Berry can be fed to a Pokémon to increase your capture odds. In Pokémon: Let’s Go, there are different tier levels to the Razz Berry including the basic Razz Berry, Silver Razz Berry, and Gold Razz Berry. The higher the tier, the more effective the Razz Berry will be. To determine whether or not to use a Razz Berry when catching a Pokémon, ready your Poké Ball during a Pokémon encounter. 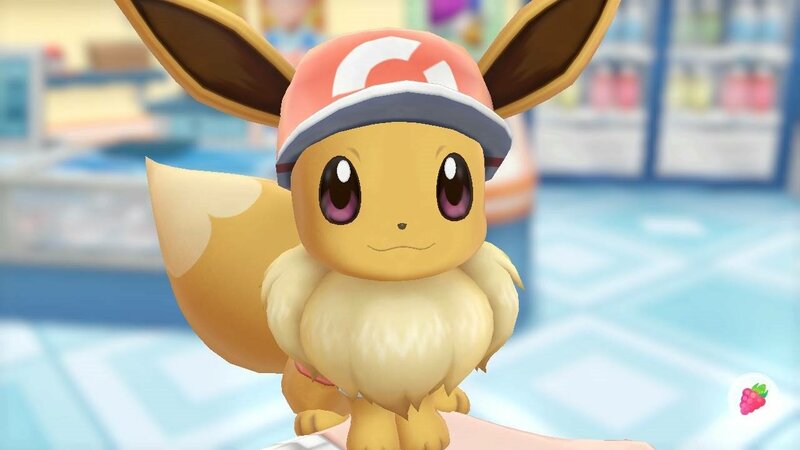 Drag and drop the Razz Berry to feed Eevee in Pokémon: Let's Go. Next, take a look at the color of the capture ring. If the ring is red or yellow, you may want to use a Razz Berry to increase your capture odds. After feeding the Pokémon a Razz Berry, take a look at the ring color again. Note that it’ll likely have changed, meaning that your capture odds have increased. You can also feed a Razz Berry to Pikachu/Eevee by playing with the Pokémon. To do this, tap “X” to open your Menu, then open select the option to play with your Pokémon. In the bottom right corner, you’ll see a Razz Berry icon. Tap on the Razz Berry, then drag and drop it over your Pokémon's mouth to feed the Razz Berry to your Pokémon. The Nanab Berry in Pokémon: Let's Go is identical to the ones found in Pokémon GO. Another Berry type in Pokémon: Let’s Go is the Nanab Berry. Similar to the Razz Berry, the Nanab Berry can be used to help you catch Pokémon. 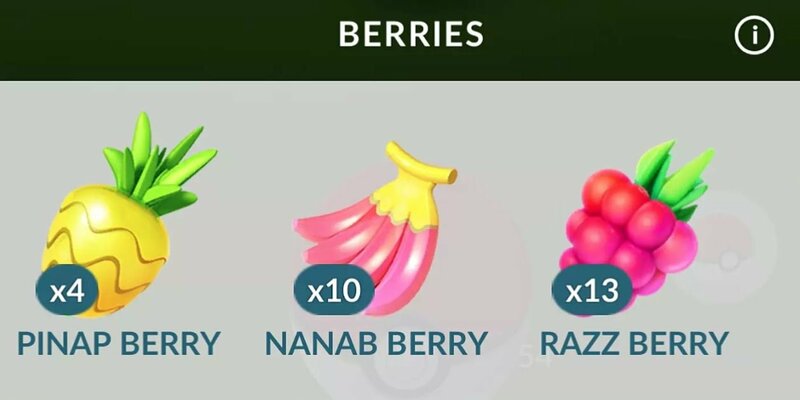 In Pokémon: Let’s Go, there are different tier levels to the Nanab Berry including the basic Nanab Berry, Silver Nanab Berry, and Gold Nanab Berry. The higher the tier, the more effective the Nanab Berry will be. Rather than increasing your capture odds, the Nanab Berry is used to calm Pokémon that are moving around erratically. By feeding the Pokémon a Nanab Berry, they’ll stop darting around the screen, thus making it easier to catch the Pokémon. In addition to calming erratic Pokémon, the Nanab Berry can be used to slow the capture rings and increase your odds of a “Great” throw. 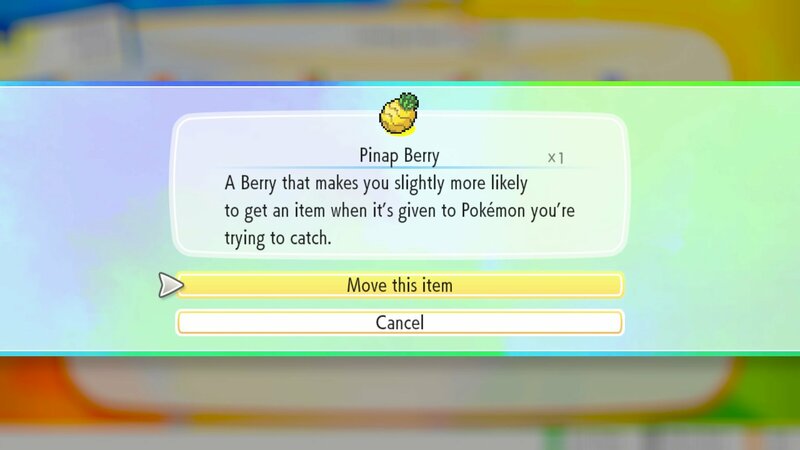 The Pinap Berry can be used to increase your odds of receiving an item when catching wild Pokémon in Pokémon: Let's Go. One special Berry type in Pokémon: Let's Go is the Pinap Berry. Unlike the Razz Berry or Nanab Berry, the Pinap Berry increases your chances of getting an item after catching a Pokémon. In Pokémon: Let’s Go, there are different tier levels to the Pinap Berry including the basic Pinap Berry, Silver Pinap Berry, and Gold Pinap Berry. When used in Pokémon GO, the Pinap Berry increases the amount of Candy that a Pokémon drops. However, Pokémon: Let's Go changes this slightly by increasing your odds of getting an item. Item drops are random, meaning that you won't know what item you'll receive when you use a Pinap Berry on a wild Pokémon. Be sure to check back, as we’ll be updating this guide as we discover more Berry types in Pokémon: Let’s Go. Until then, have you used a Berry in the game? If so, what do you think of using Berries to increase your capture odds? Let us know down in the comments below! For more on Pokémon: Let’s Go, be sure to check out some of our previous guides including where to find Professor Oak in Pokémon: Let’s Go, what your Rival’s name is in Pokémon: Let’s Go, and how to link your Poké Ball Plus to Pokémon: Let’s Go. By reading through this guide, you should now know all Berry types available in Pokémon: Let’s Go.